This is hardly evidence of a causal relationship, as some of the emotional talking heads on mainstream media would encourage you to believe. 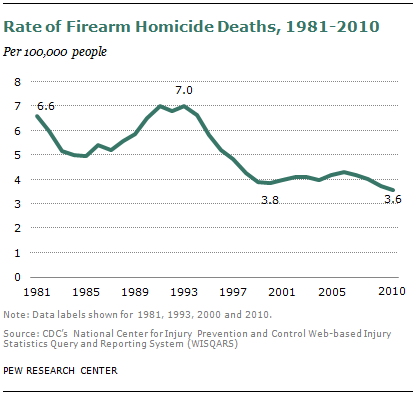 In fact, the contrary has been true of this relationship, as the gun ownership rate in the United States has climbed by roughly 50 percent over the past two decades while the national homicide rate has declined reciprocally over the same period. As it turns out, firearms are a necessary, but not sufficient, case for gun-related homicide. A more ideal example of such a causal relationship is found between monetary expansion and the rate of general price increases, which the Federal Reserve Bank of Minneapolis has quantified at around 90 percent. But the quantity of firearms and the incidence of gun-related homicide fail to bear even a semblance of this relationship. Indeed, when two variables trend inversely over time, it may be audacious to steadfastly stake a claim of causation, but one would surely be irresponsible to simply dismiss the data in somehow claiming the opposite is true. In the case of firearms and homicides in the United States, the population has demonstrably become far more civil, at least as gauged by the statistical domains of homicide incidence. Of course, one might reasonably stake the claim that there has simply been a mass exodus from physical interfacing to online social media, where anyone can readily stumble upon the modern exhibition of combative discourse. Ultimately, the United States is presently home to more firearms than at any other time in its history. Meanwhile, the population which resides within its borders has scarcely ever been safer from the violence which can accompany their use. And it appears all too common an oversight, particularly amongst the anti-gun cohort, that the utility of weaponry is not specifically limited to its violent uses, that its principal feature is found rather in its relatively dormant and less theatrical life stages. These are indeed the stages wherein the weapon is holstered for security and peace of mind. The value thereof always escapes formal measure while eluding everywhere the remotest interest of the propagandizing reporter. This is the true tale of the average weapon, not a maniacal thriller of Hollywood proportions, but rather a sedated story of assurance accompanied by hopes that the family, couple or individual will never have to rely on it. In the case of gun violence in this country, there is simply insufficient evidence to prove that firearms have acted as a principal cause of homicide. Although they have been one of the primary tools employed by aggressors, they can seldom be identified as the cause.